The Navy’s collection of wartime art has almost skipped a generation — a problem you can help solve. Art curators with Naval History and Heritage Command have plenty of pieces from World War II and the Korean War — everything from paintings by official Navy artists to cartoons drawn on notebook paper. Vietnam and Desert Storm are well-represented in the Navy Art Collection, as well, but there are few works from current sailors. Examples: Cartoons from active-duty sailors could be displayed alongside those drawn during World War II, or paintings of modern ships in action could be used in a traveling NHHC exhibit, which stops at local museums as a way of “showing people the great things the Navy does,” Munro said. It’s a small way to make history, and to continue a legacy of Navy art that dates back quite a few years. See about the Navy Art Collection, and some samples from throughout history, here. VR-55 NAWS Point Mugu Ca. Has a lot of artwork! Petty Officer Bose did a lot and I did a few! 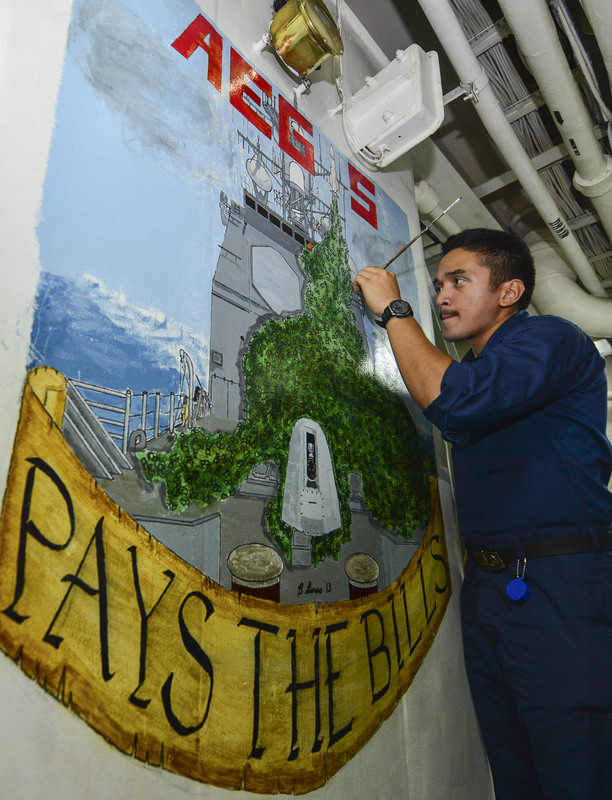 I am the artist in the picture painting a mural on deployment while we we’re in the gulf. I am honored to be a part of this article. Another Munro. Coast Guard Signalman First Class Douglas A. Munro received the Medal of Honor in World War II.